today there will be just a very little update, because we are very busy to get the Samba´s chassis ready for Amersfoort. We really want to show it there on its wheels and as you can imagine this is not an easy job…..
My answer is always the same (see the post´s headline) and the reaction to my answer is nearly always the same: people don´t understand why I am not going for a full restoration ending up with a shiny as-new-Samba. So I try to explain the philosophy of the project once again. I do like cars which tell a story. The story of the car´s life, the story of the owners, the story of the social circumstances the car lived in, the story of the country. I don´t blame anybody who is going the painful way of a full restoration, it´s my living to sell parts for these projects, but left to my very private taste I always prefer to look at the unrestored cars when I go to a VW-meeting, it´s just more interesting in my eyes. 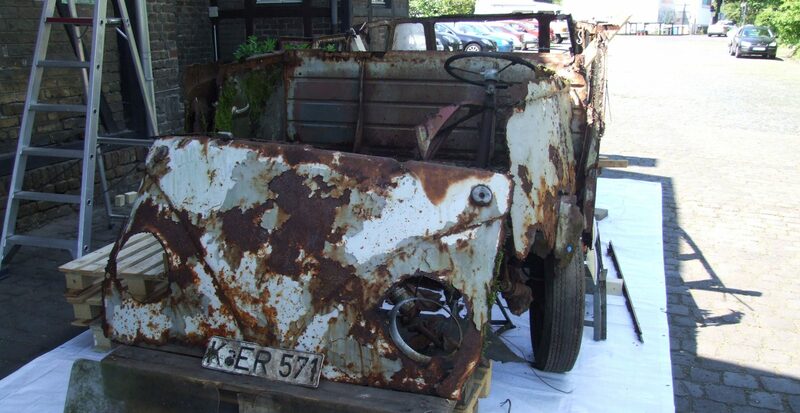 Sure this Samba was in such bad condition I wouldn´t ever be able to drive it to a meeting at all. And as much as I like unrestored cars, what are they good for if I can´t drive them, if I can´t share my joy with other VW-friends at a meeting? So the way for my Samba was clear: bringing this baby back to the road, but save as much as possible of the (rusty) history. If you don´t understand what this means, just scroll down and see the great job Mark Spicer did regarding the rear hood. This is the way the entire Samba will look like! And this philosophy does not stop at the outer body. I am very consequent following this road even to the little details. For example now while I am completing the Samba´s engine. See here a close up of the fuel pump. 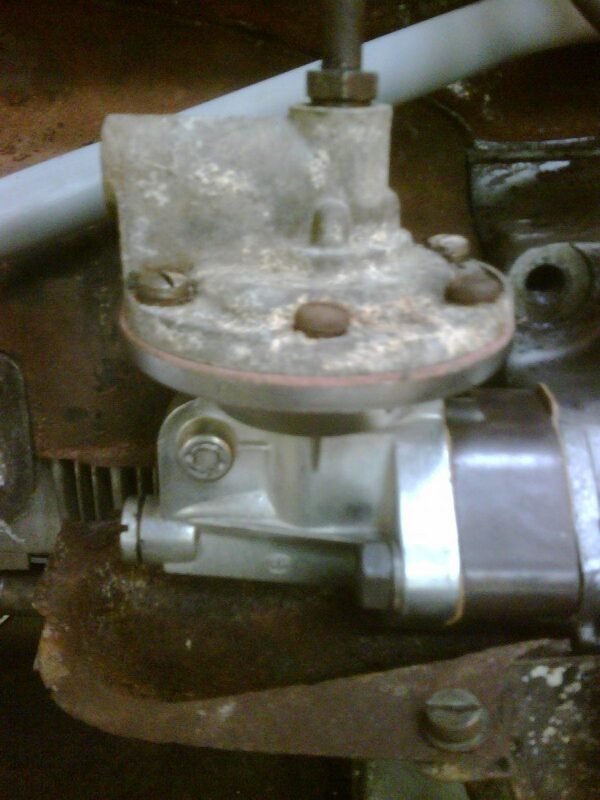 As you already knew from a previous post the lower part of the pump was broken and I didn´t see a way of welding it. So I had to go for a replacement, an original time period replacement of course! This replaced part was cleaned and polished professionally to as-new-state. Sure the pump was fully rebuild inside too as I want this Samba to drive someday. But the upper part of the fuel pump will stay exactly the way it was found and I am not going to clean or polish it ever. See what I mean? There was a wrong, later manifold with the engine (and it was broken too) when the Samba was found, so this one was replaced and you see it is replaced, cause it looks as new. 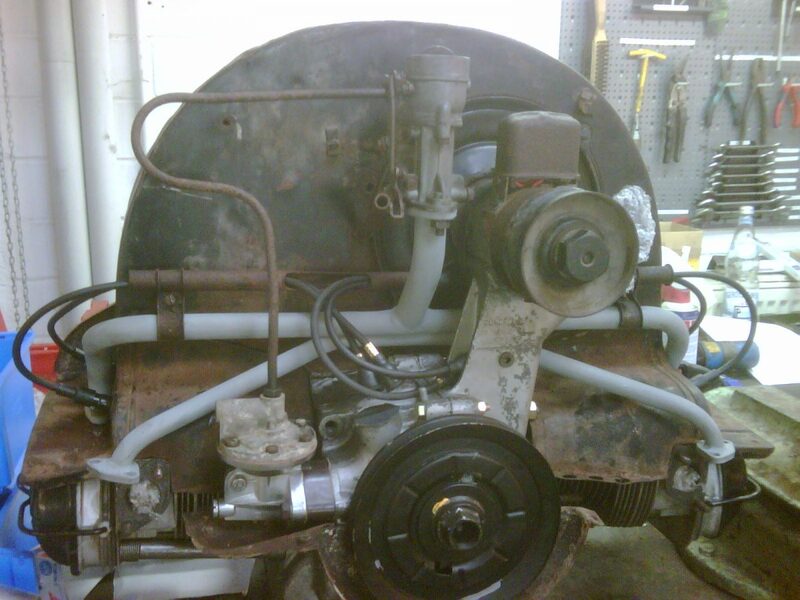 The fuel line between the pump and the carb is still the rusty, original one. The carb was fully rebuild inside, but still shows its dirty surface outside, the same story regarding the generator and the precious D-regulator. Got the idea? This is the philosophy of the project: all parts which I am forced to replace, because they don´t work technically or they are just missing, will be polished, painted, chromed or whatever brings them to as-new-condition. All parts which were at Samba when it was found will stay the way they were: rusty, dented, bend or mishandled! In the end we will look at a car which does not exist in the scene so far: a wild mix of fully restored and poor rusty Samba. Weird? Odd? Yes, just the way I am too.